See TeachersFirst's collection of resources to help students learn the customs and traditions of the Muslim Ramadan month of fasting. This collection could be useful in a study of world religions, an exploration of the mideast, or world cultures. 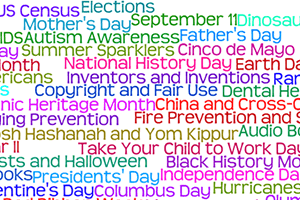 Include the link on your class web page as students investigate different holiday traditions. Exchange pen and paper and have students create blogs sharing their learning and understanding by using Telegra.ph, reviewed here. With Telegra.ph you just click on an icon to upload images from your computer, add a YouTube or Vimeo, or Twitter links. This blog creator requires no registration. If you are teaching younger students and looking for an easy way to integrate technology and check for understanding, replace pencil and paper and challenge your students to create a blog using Edublog, reviewed here. Our own collection of Hanukkah resources helps students from all backgrounds understand the origins and symbolism of Hanukkah. This collection of reviewed resources from TeachersFirst is selected to help teachers and students understand how earthquakes happen and learn about famous earthquakes in history. Also included are sites and tools well suited for projects about earthquakes. Share this collection as a Favorite on your TeachersFirst public page so students can use the resources as part of a project during your unit on plate tectonics or natural disasters. Use the collection as a starting point, noting the resources that are more challenging for your more able students. Here's a list of 50 things you and your students can do to celebrate the 100th day of school! Email this to your colleagues or share it with parents for them to join in at home. This collection of reviewed resources focuses on Internet safety and its many concerns: protecting your digital footprint, protecting your identity, 'netiquette, email use, and much more. Find varying levels of information for different age groups and materials to help parents cooperate in educating their children for digital citizenship and safety. Use these resources in toto or select the best ones for YOUR students to continually model rational, safe behavior online. Share the links with parents and among your colleagues so you can promote positive action instead of fear about the Internet. Find specific projects and lesson plans to fit student/curriculum needs from this extensive collection. Mark this list in your favorites to try new ideas on the first day of school or even at the start of a new marking period. This collection of professional resources deals with topics related to school violence and how schools and teachers should respond. Keep this bookmarked for handy reference when incidents in the news raise concerns in your school. The potential spread of Swine Flu in schools and among young people is a major concern. TeachersFirst's editors have collected this helpful information for teachers, students, and parents to better understand the virus, how it is spread, and what YOU can do to stay healthy. This collection of resources has been hand-picked for accuracy and for age-appropriateness with students and so we may all participate in healthy prevention of the swine flu. Share these resources with your colleagues and school parents by emailing the page or sharing the link from your school web page and in your school newsletter. This collection of editors' choices from TeachersFirst will spark summer excitement for parents and kids alike. Whether your want to create something, ignite new learning, or hold on to what you already know, you will savor these safe, reviewer-recommended resources. Be sure to share with your friends, neighbors, and family. Teachers will want to share this page with students departing for summer break. Summer will never be "boring" again! Share the link to this special collection via your class web page, newsletter, or email to all your students as they depart for vacation. You will help parents and students alike. Avoid the "summer slide." Understanding how world economic systems work can mystify even the experts, but all of us need to understand the basics of how an economy functions, especially as current events challenge us to adjust to tough times. This special collection of resources has been hand-picked by the editors of TeachersFirst from among our many reviewed resources on economics and money. These selections were chosen to help students (and families) grasp basic economic principles, personal financial planning, and banking at an age-appropriate level. Browse these editors' choice resources to find the best for your classroom needs. Don't forget that you can use economics information to teach math concepts. Make your lessons relevant in today's world by connecting the economic concepts as you teach writing, reading, and more. As your students master the concept, have them create a "Kids Guide to the Economy" on a class wiki or make videos on single concepts to be shared via tools such as SchoolTube (reviewed here) or TeacherTube (reviewed here). Every four years, the U.S. celebrates the peaceful transition of power from one administration to the next. We all note 2009 as an especially historic year in U.S. history, with the juxtaposition of Lincoln's 200th birthday and the inauguration of President Barack Obama. No matter what grade level you teach or candidate you support, Inauguration Day is an important event worthy of notice in your classroom. This list of reviewed resources from the TeachersFirst database will help you find ways to include the inauguration and its historical significance in the context of your curriculum. Since news sources often generate specialized but temporary web resources just in time for Inauguration Day (January 20), you will also want to use a Google News search for the most timely information, such as news articles and images. Combine these with the historical background and ideas below to help students gain perspective and a deeper understanding. Since news sources often generate specialized but temporary web resources just in time for Inauguration Day (January 20), you will want to use these resources in combination with a Google News search for the most timely information, such as news articles and images. Assign older students to compare historical background and current practice in a chosen aspect of the inauguration and create a multimedia presentation, wiki page, or mock "news" video about the day's events. Share selected images and explanation with younger students using your projector or interactive whiteboard. These resources from the TeachersFirst database provide lesson ideas, activities, research materials, and interactive sites for studying Martin Luther King, Jr.
Use this collection to inspire lessons for January 15 (or the Monday holiday nearby) or during any unit on civil rights. If you wish to choose from a more extensive list election-related resources or to narrow your list for a specific topic and grade level, try entering your topic and elections as search terms in the TeachersFirst keyword search (under Search menu), setting the grade level you seek, as well. Use this handy "spcial topics" collection to find just the right student activity or reference information when you are studying elections. You can also share it on your teacher web page as an "approved" list of election resources for home and school study. Read about possible grant sources and contests to fund your innovative ideas for teaching with technology or for professional development. TeachersFirst has no affiliation with the organizations offering these grants. We offer the information in support of your great ideas and hard work.